Seeking a professional-looking infographic template? MasterBundles offers you versatile Infographics Templates Bundle to use for both business and personal projects. It goes without saying that infographics help to present even the most boring data in a fun and understandable way. This is why, they are widely used in education and presentations. Why Should Designers Invest In Infographic Template? All of these infographic elements are easy to use and customize in Adobe Illustrator. Any other software for vector graphics will do as well to handle .EPS, and .AI vector files. Feel free to use the infographic template files for all types of projects, business or personal likewise. What’s cool, these infographics have an extended license, so you can use them without limit. No additional fees are required! Select exclusive infographic templates to put together unique designs with minimal effort! REQUIRED SOFTWARE: Adobe Illustartor or other software that can handle EPS, AI vector files. 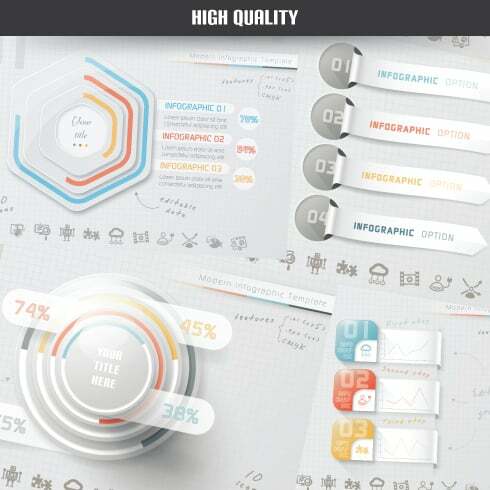 Precisely what is Awesome Infographics Templates Bundle? If you are a artist taking care of multiple assignments , you comprehend the importance of the whole bunch of design items at hand. Searching for those components separately, you may spend whole lot more time and money as a result. To obtain all of the essential elements within a single pack, we advocate taking a closer look at graphic bundles. A bundle is a assortment of design elements meant for graphic design, priced at a large amount of money, however offered at a substantially reduced price for a limited time. So why are Awesome Infographics Templates Bundle consistently profitable? For any design project, you will require a bunch of elements – a font, a number of images, just a few icons, etc .. In case you would wish to purchase every one of them on an individual basis it will cost you a lot of money! And so, for this reason knowledgeable web designers look for graphic bundles to purchase. They permit buying a big handful of different elements for a small price tag. The selections of components compiled into a graphics package deal are often categorized as outlined by their kind or purpose. There could be packages with business card templates, mockups, wedding invitation templates, infographics and icons, etc. You will likely be able to find graphic bundles especially for Halloween, Christmas, Halloween or Christmas. Any ways to make packages even more affordable? Are you looking for a 5% price reduction on any deal from MasterBundles? It’s not that hard. All you need to do is merely share the web page with a package on social network (Facebook). When completed, the price reduction will be immediately added to your shopping cart. MasterBundles offers you a large variety of different products. MasterBundles.com offers not only graphics bundles but also approximately 20 other various kinds of items. Fonts, WordPress themes, mockups, icons, photos, illustrations, presentation templates and much more – on the MasterBundles.com it’s possible to locate all the products, necessary for a design. Articles on blogs which have infographics are usually more readable than those that don’t. Which means that, infographics tend to be a popular product every designer has to be qualified to produce. 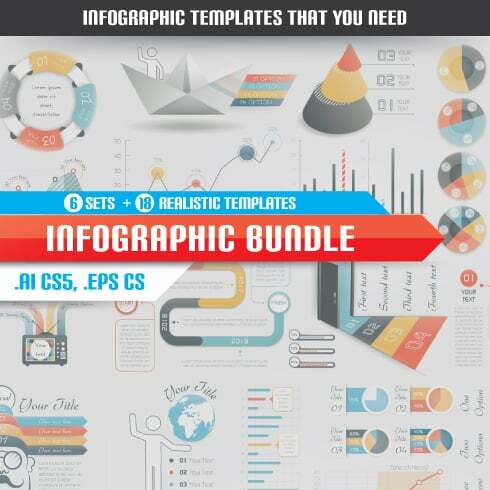 A bundle for infographics is most effective given it provides an almost ready option. The web designer just has to combine the images and voila! The infographic is completely ready. If you feel as if you have lost tons of time while looking for various tools and elements for your own graphic design tasks, it is a high time to learn more about MasterBundles. This is a platform providing the most widely used tools (graphics, logos, presentations, fonts etc.) for web designers, entrepreneurs, and developers at an affordable price for a limited time. On top of that, you can use discount coupons and promo codes for specific design deals. To not miss significant information regarding the future promos, we recommend following our blog and signing up for the newsletter.